What should be a short Planning Commission meeting Monday, January 11, 2016 commences at 6:00 p.m. in City Council Chambers at City Hall. You can read the brief agenda report HERE. I say "short" because there are only a few items on the agenda and, according to the staff report for Public Hearing #1, HERE, the staff recommends continuing it for six weeks. 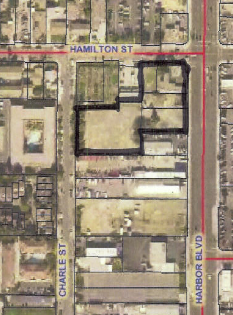 This involves a request for a two-year time extension for a 28-unit residential and live/work development at 2089, 2095 and 2099 Harbor Boulevard. The reason given in the cover sheet of the long staff report is, "The Applicant has requested additional time to re-assess the site remediation action plan and the timing of the project." Well, that may be the case, but it's possible there's more to this story. I've seen correspondence within the past couple days that brings into question the actual ownership of a chunk of the property involved. We'll see how this plays out Monday evening. Public Hearing #2, HERE, involves the Master Plan for the reconstruction of Fire Station #1 at 2803 Royal Palm Drive. The staff is asking the Planning Commission to approve the plans as presented subject to conditions and to advise them on one of two design options - one a contemporary design and the other a more modern theme. Improvement of this station is long overdue, so we look forward to the discussion of this project. You may recall that the cost for this project is estimated to be $7 million in construction and $1.5 million in design, temporary crew relocation during construction and construction management services. It is estimated to take two years to complete. Some may recall that the financing of this plan was included in the bond scheme proposed to create a new Downtown Library. Public Hearing #3, HERE, is a planning application for a two-unit residential small lot subdivision development at 2242 Pacific Avenue, at the corner of Wilson Street. Each unit would be greater than 2200 square feet. One would orient to Pacific Avenue and the other to Wilson Street. No deviations are requested for this project. And that should be it, barring any unforseen events that might occur during Public Comments. One never knows these days. It looks like the only way to get rid of this stupid high density crap is to eliminate the problem at its root. Vote the councilmen out of office ASAP.